Please note: This website has a new url, please update your bookmark. Lead systemic juvenile justice reform efforts. This website can and will get updated in the future without notice. 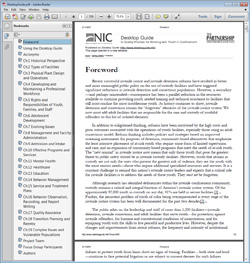 A PDF downloaded to your local computer will in time, become out of date. The search engine on this site is similar to Google or Bing. If you are doing a multi-word search such as Mental Health, the search function will deliver results where it finds those two words in a particular chapter but not necessarily in the order you typed them or next to each other for that matter. If you want to limit your results to the exact way you typed them in to the search box (this is called a Phrase) you must include "quotes" around the words such as "mental health" to let the search engine know you only want results where this phrase occurs exactly as typed.